This case study was updated in March 2017 to reflect information on the completed bridge. The first version of the case study was posted in April 2014. The project included building a portion of the towpath trail on the west side of the river and an all-purpose trail on the east side, allowing for alternative modes of transportation around the city (PD-10 Pedestrian Facilities and PD-11 Bicycle Facilities). Saved more than 100,419 gallons of diesel fuel – enough to power a big-rig from Cleveland to Salt Lake City and back, 145 times. Recycled more than 5,658,078 pounds of steel, about the weight of 1,414 average-size sedans. Saved 22 million gallons of water, enough to power a shower around the clock for almost eight years. Prevented more than 125,143 cubic yards of waste from entering landfills – more than twice the concrete it took to build First Energy Stadium – home of the Cleveland Browns. The Phase I project scored 59 points on the urban extended scorecard of the INVEST project development module, achieving the Gold level. It scored particularly well on PD-03: Context Sensitive Project Development, PD-8: Stormwater, and PD-29 Construction Quality Control Plan. For instance, the project received the maximum number of points under PD-08 Stormwater for each of the three categories (water quality, flow control, and low-impact development). These outcomes are particularly important as the project is located in a combined stormwater-sewer area, meaning that when rainfall exceeds the system’s capacity sewage discharges directly into rivers and streams. 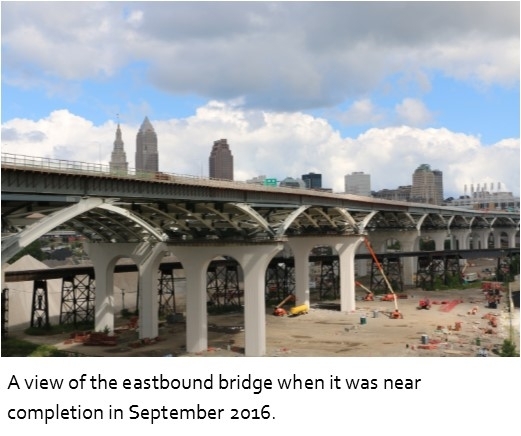 The bridge project separated stormwater from combined sewers draining 20 acres, treating the separated runoff with extended detention basins and reducing pollution to the Cuyahoga River. Using INVEST retrospectively, after construction of the Phase I project, showed that Phase I achieved a high level of sustainability – INVEST Gold. ODOT went further for Phase II and used INVEST prospectively. 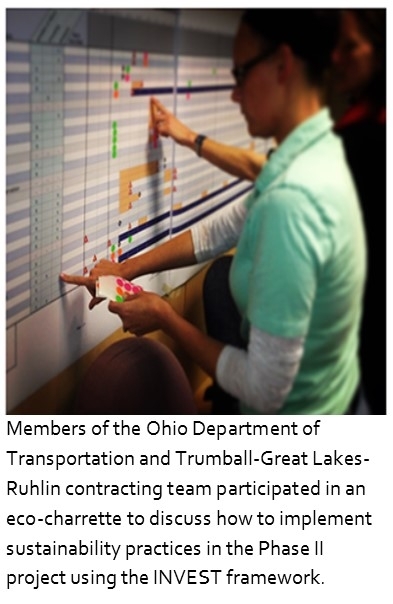 ODOT incorporated INVEST requirements into the contracting process and used INVEST rescoring to keep track of sustainability progress at decision points throughout project planning and construction. The approach paid off, with Phase II achieving INVEST Platinum. ODOT issued a Request for Proposals (RFP) for the design-build contract for Phase II of the project, the eastbound bridge, in 2013. The RFP required the contractor to develop a sustainability plan and use INVEST to demonstrate sustainability achievements. ODOT asked contractors to state in their proposals how many INVEST points they could deliver and commit to achieving a certain sustainability level. Disadvantaged business enterprise (DBE) and on-the-job training (5 points). The INVEST requirement was included in the sustainability score. After the ODOT scoring teams scored each proposal on technical approach, ODOT opened the price proposals. ODOT then selected the winning contractor team using a best value formula with price contributing to 70 percent of the final score, schedule 10 percent, and technical score 20 percent. The winning contractor committed in their technical proposal to achieving a Platinum INVEST rating and bid $273 million, $19 million below the ODOT official engineering estimate of $292 million. As such, the Value Based Design Build Process yielded a winning proposal with higher sustainability and lower cost than previously estimated. The winning contractor committed to achieving 95 INVEST points out of a total possible of 126. This is 47 points over the baseline required by the scope. 17 of those points were attributed to previous ODOT work while 30 points were ones that the contractor would bring through their actions. For example, the contractor proposed to follow a five minute idling policy and use construction equipment with engines meeting US EPA Tier 3 standards, scoring two points under PD-26 Construction Equipment Emissions. The contractor included a sustainability-focused sub-contractor in their proposal to conduct life cycle cost and benefit cost analyses, facilitate incorporation of sustainability practices, and track progress towards meeting sustainability goals. The winning contractor’s INVEST score was the highest of the three bidders. After award of the project, the developer, ODOT, and FHWA held an eco-charrette to discuss how to implement sustainability practices in the Phase II project using the INVEST framework. As ODOT engineer Matt Perlik explained, “The tone of the eco‐charrette was a professional challenge. We defined the challenge and let the engineers and contractors loose. The engineers and contractors involved seemed to respond well to defining sustainability for this project when they were graded on how well they did.” ODOT also made it clear at the eco-charrette that they would hold the contractor to their commitment to achieve an INVEST Platinum rating. At the eco-charrette, the developer and ODOT reviewed each of the INVEST Project Development criteria in break out groups as shown below based on subject matter expertise. The groups looked at each scoring criterion and determined if obtaining the credit for the project was Yes (it is in the project), Probable Yes (it is likely and under consideration), Probable No (it is unlikely but still under consideration) and No (it has been evaluated and is not in the project or is not applicable). Responsible parties were identified to follow-up on action items after the workshop to help gather any necessary information to finalize that scoring criterion. As the project was design-build, there were many scoring items that were not be able to be fully scored until later in the project. By bringing together all the key people from the contractor and ODOT to walk through nationally vetted transportation sustainability criteria, the eco-charrette enabled the team to integrate sustainability into the numerous decisions to be made during the life of the project. Following the eco-charrette, the project stood at 67 Yes points, 22 Probable Yes points and 17 Probable No points, as shown in Attachment 2. This meant that for the team to achieve a Platinum score (76 points minimum), the team would need to move 9 of the Probably Yes points to Yes over the course of the project's design and construction. For the team to achieve its original goal of earning 95 points, the team would need to move all 22 Probable Yes and 6 Probable No points to Yes. As an example of how the eco-charrette impacted decision-making, while discussing the criterion PD-20 Recycle Materials, the contractor noted that the project would score one point for using 15 percent recycled asphalt pavement, but would not receive the four additional points available for using greater than 50 percent, because ODOT standard specifications currently only allow for a maximum of 15 percent recycled content. ODOT staff then responded that the specifications allow the contractor to go beyond 15 percent in consultation with the ODOT engineer. The group then assigned a member of the contractor team to explore with asphalt vendors what percentage of recycled content is available and then speak with ODOT about whether higher levels should be integrated into this project. As a result, the project incorporated a higher recycled content, averaging 20 percent, resulting in greater sustainability. This conversation would not likely have happened without the INVEST eco-charrette. As the project progressed, the team met every six months as project decisions were made to re-score the project with INVEST and track progress towards sustainability goals. The team used the INVEST website Scoring Notes, Next Actions, and Upload Supporting Documents functions as well as an activity report to track scoring, documentation, issues that must be resolved, and action items needed for the team to move forward in evaluating and resolving each criterion. Some INVEST criteria require early consideration during design (such as INVEST criterion PD-10 Pedestrian Access). By contrast, others require on-going tracking for the duration of construction (such as INVEST criterion PD-29 Construction Waste Management Plan). To ensure that each criterion is addressed at the optimal time, the contractor team developed a sustainability schedule intended to overlay the project schedule. The schedule highlighted action items and key dates to ensure that the team made efficient use of time and that windows of opportunity to fulfill INVEST criteria were not missed. This is particularly key for a large project in which decisions are spread out over a long period of time. The INVEST program for the Phase II bridge project began in October 2013. Most major INVEST-related tasks required were completed by August 2014. Several items requiring on-going tracking continued beyond August 2014, concluding in 2017. To ensure clear lines or responsibility, the project team assigned lead and support roles for each INVEST criterion to individuals in eleven task forces by issue area. The sustainability sub-contractor led the sustainability task force and coordinated the INVEST effort. By including a requirement on INVEST in the RFP for the design-build contract, ODOT provided a strong incentive for bidders to incorporate sustainability practices in their proposal while keeping costs competitive. The collaborative workshop with the developer, ODOT, and FHWA using the INVEST framework enabled the key players to identify specific opportunities for sustainability improvements. With an early project eco-charrette, these key project decision-makers were able to consider sustainability while making numerous project decisions. The Phase 2 George V. Voinovich Bridge project had better economic, social, and environmental outcomes than would otherwise have occurred. A few highlights of Phase 2 sustainability achievements include: PD-3 Context Sensitive Project Development. This criterion involves working with the public to make decisions regarding the project. The strategy was used in items such as the decorative crowd wall, part of the city’s new front door, and the creation of a new neighborhood park where the bridge touches down on along the west side. PD-19 Reduce and Reuse Materials. The project reused 2,338 tons of rebar and 13,044 tons of concrete. PD-21 Earthwork Balance. The contractor reduced the need for the transportation of earthen materials (soil). All earthwork material excavated on the job was used as fill in other areas within the job limits. No material was hauled away as “excess fill” or “waste” to an off-site location. Similarly, no offsite material was used as fill on the project. PD-29 Construction Waste Management. Diverted more than 75% of construction waste. 100% of the old Innerbelt Bridge has been either reused or recycled. The steel has gone to a recycling facility. The concrete has been crushed for use on this or other projects. 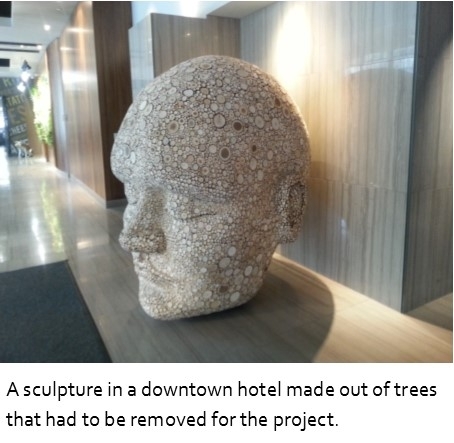 Some of the trees that had to be removed for the project were used in a signature art piece in a downtown hotel, while others found a new home in the new Cleveland Metropark Zoo tiger exhibit. These outcomes go above and beyond minimum requirements while maintaining affordability.